Great, cozy hostel with super nice staff! They were all super helpful and sweet. There is a kitchen where you can make your own foot, and the overall atmosphere there is really good. Great place if you wish to stay a place that is calm and relaxed. The only less fortunate thing was that the toilet couldn't flush when I was there, but everything else was good. 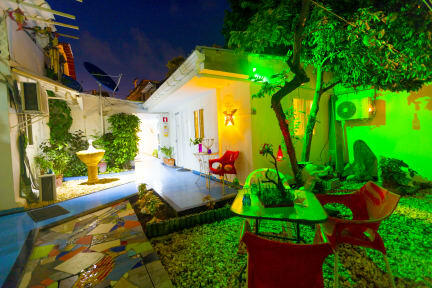 Nice laid back hostel perfect for chilling out on San Andres. Hammocks were a nice touch to chill out in. Room was comfy with amazing working air con which is much needed on this island. Is about a 15min walk into the centre but there is a supermarket very close. Kitchen is sufficient. Staff very friendly and helpful. we were the only guests staying at the time but to be honest that was absolutely fine for us and our plan for San Andres, although less ideal probably if you’re solo travelling. 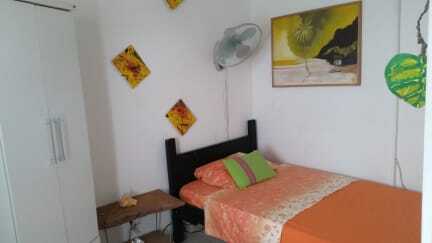 Clean and cosy hostel about 10 minutes walk away from to the downtwon of San Andres. Ernesto is a really cheerful and friendly host with lots of ideas about what to so and see on the island. Great family run quiet place! About 10 min walk from the airport and 10 min to downtown San Andres. The bedroom was clean and well equipped with both air con and a fan which was welcome! But the kitchen was dirty and there was very little communal space. The wifi didn't work and they were not helpful when trying to book the ferry to Providencia. When arrived the owner could not find our booking and was blaming us for not booking our room properly. Then he called the staff fron hostel world and we found out that this was his fault. He sent us to another hostel, which was in a dangerous area close to the airport. The hostel was actually part of a church so we were completely alone and the atmosphere was awful. Not to mention the fact that we lost an entire evening to sort out our booking and find the new place. After having my booking confirmed by the hostel world I went there as soon as my plane landed. In turns out they had overbooked the hostel and sent me away without helping to find a new place to sleep. I found out later this also happened to another traveller that same day, and happens on a regular occurrence!